Toward the end of the calendar year, holidays seem to bunch up like Hummingbirds at a freshly filled feeder. Shopping must be completed! Menus must be planned! Parties must be attended! What’s left of bank accounts must be balanced! One must approach this potential mayhem by being organized, remaining calm and sensibly prioritizing all that must be accomplished in order to survive this festive season. As a couple of pragmatic veterans of many, many, many joyous annual celebrations, we instinctively know what we have to do. Florida’s “Nature Coast” is an area from Pasco County, just north of the Tampa area to Wakulla County, where the “bend” of Florida’s panhandle begins to head west. This is not an area (yet) of cartoon-rodent influenced carnival rides, five-star hotels or glistening white-sand beaches bordered by glistening white-painted condominiums. Instead, one can find vast hardwood swamps, clear rivers fed by underground springs, salt marshes teeming with wildlife, small eateries serving fresh seafood and actual native Floridians (an endangered species) going about their lives secretly hoping the highways will become overgrown with weeds and cut them off from any further invasion of “civilized” society. That’s where we spent a glorious day recently instead of going to the mall. Yes, we do feel guilty. Extremely. We arrived in the Bayport area just as the rising sun touched the expansive salt marsh along the drive to Pine Island. The grass took on the golden glow of the winter dawn and we just sat still and took it all in. The grass seemed to come alive as wading birds began to call and crabs scurried across the mud hoping the tide would soon return to help them hide. Bald Eagles, Ospreys and Northern Harriers soared overhead in their patient search for the first meal of the day. From the fishing pier at Bayport, we watched squadrons of Brown Pelicans splash down in the shallow water, scooping up gallons of small fish. Terns and Gulls wheeled noisily above us and a pair of Horned Grebes floated and dived in the deeper waters of the boat channel. A Green Heron stood motionless in the reeds waiting for a blue crab to become careless. In the picnic area is a stand of hardwood trees which makes a fine place to find songbirds. In just a few minutes, we saw a Red-shouldered Hawk, Palm Warblers, Pine Warblers, Black and White Warblers, Blue-gray Gnatcatchers, White-eyed Vireo, Tufted Titmice, Northern Cardinals, Red-bellied and Downy Woodpeckers and Eastern Phoebes. Our early lunch sandwiches were enjoyed under palm trees with an unobstructed view into the seemingly infinite blue water of the Gulf of Mexico. It was Winter and warm and the soft sand begged us to go barefoot. Butterflies gathered nectar from bright, blooming flowers all around us, birds filled the air with joyful noise and we were utterly alone in our mutually shared universe of happiness. THIS is our holiday. THIS is our realization of how blessed we are. Here are a few images of our day. We hope your holiday season is full of peace and joy! See you next year! The salt marsh takes on a special glow at sunrise. Wood Storks are known locally as “Flinthead” due to the gray coloration of the skin on their heads. We were fortunate to find a Clapper Rail at the edge of some reeds. These birds are much more likely to be heard than seen. A Greater Yellowlegs found a tidal pool and ran around like crazy trying to corral small fish. Bright orange Gulf Fritillaries added a splash of color to the marsh. Bayport Park has a very nice new picnic area and boardwalk. Here we found a half-dozen Red-bellied Woodpeckers. Yellow-rumped Warblers liked the picnic area, too. This one was curious about what I was doing there in the middle of winter. Even the visiting Monarch butterflies enjoy a day at the beach! This purple beauty is the Glade Lobelia and was quite prolific in the ditches along a back road. Non-breeding plumage of the Sanderling helps it to blend in with the light-colored beach sand. One of my favorite Florida natives enjoys fresh fish almost as much as I do. This Osprey just caught a mullet and found a handy buffet table in the form of a dead tree branch. He stared at me for a bit just to let me know he would NOT be offering me any of his lunch! This has been a spectacular year in our lives and we feel enriched to a large degree by all the kind friends we have made through this amazing medium of “blogging”. Thank you all so very much for your positive response to our humble efforts. My Sweetheart and I had to update some paperwork at our local military base the other day and took the opportunity to explore a bit. It has been four years since our last visit and there have been several changes to the area. MacDill Air Force Base is located near Tampa, Florida and is on a peninsula jutting into Tampa Bay. This base has been a vital part of the U.S. Air Force mission since officially opening in 1939. Military bases are like small cities and must be able to support the large number of people living and working there. Part of this full range of amenities at MacDill includes a very nice recreation area. There are a marina, boat launch, beach, camping area, fresh-water lake and several miles of shoreline along Tampa Bay. There was a break in the clouds and we had a bit of actual blue sky for awhile. I popped over a sand dune to see if anything interesting might be on the beach. The entire length of the small beach was covered with birds! As I slowly moved up the shoreline, the birds seemed to pay little attention to me and were busy preening and resting. I only had 20 minutes before another rain shower moved in but during that period saw 25 species of birds and took over 200 photographs (okay, so many were multiple shots of the same birds). Highlights included: 140 Black Skimmer, 60 Marbled Godwit, 50 Sandwich Tern, 35 Royal Tern, 35 Semipalmated Plover, 30 Laughing Gull, 20 Forster’s Tern, 15 Dowitcher, 15 Brown Pelican, 10 Willet, 10 Western Sandpiper, 4 American Oystercatcher and 2 Roseate Spoonbill. What a nice brunch that turned out to be! I think we won’t let four more years pass before we visit the air base again! Hope you enjoy a few of the sights we found. A Roseate Spoonbill cruises just off of the beach on his way to a lagoon for a little fishing. Just a couple of weeks ago, these Marbled Godwits were likely munching bugs in grasslands a couple of thousand miles northwest of here. The next three images provide perspective on the Marbled Godwit’s size. A Semipalmated Plover looks pretty small and has to take a lot of little steps to keep up with his larger cousin. Dowitchers might appear large next to a Least Sandpiper, but seem miniature next to the Godwit. With the larger Godwit in the background, Royal and Sandwich Terns preen. Small “peeps”, Western Sandpipers, gather on the lee side of a small dune as more foul weather approaches. 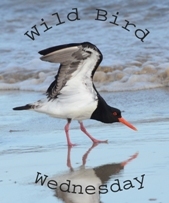 The American Oystercatcher is quite striking with its relatively large size and coloration. These Black Terns probably should be further south by now but have been delayed by the weather. It’s interesting to see them feed by “plucking” prey from the water as opposed to the headlong dives of other terns. A Common Tern rests on the beach. Despite their name, I don’t see very many of them. A pair of Black Skimmers dwarf the Black Tern flying along with them. The Black Skimmer often lays his large bill on the sand when resting, giving the appearance of a bird in distress. The normally drab-looking Willet is stunning when it displays the black and white of its wings. Birds take refuge on the protected side of a tree on an inlet as the next storm approaches. I took refuge in the truck! If one must take care of administrative errands, including a romp on the beach helps make the task more enjoyable. If the romp includes an unexpected gathering of a couple hundred birds, so much the better!